Even the best computer needs to be restarted every once in a while. Between the toxins and chemicals in most modern western foods to the particles in the air we breathe to the stress that we put ourselves under at work and home, there are times when what you need more than anything is a chance to clear out the mind and body and start fresh once again. 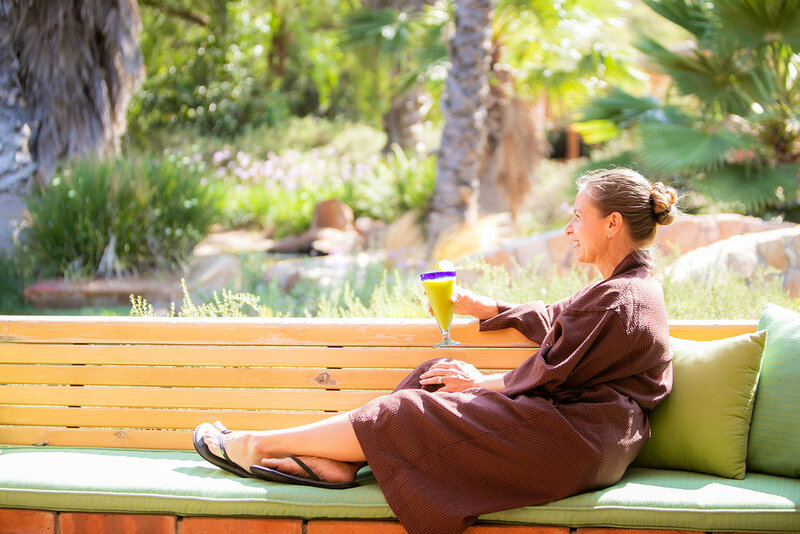 Cleansing retreats are designed to refresh and restore the body inside and out. Relaxing and fun, these retreats are an escape with a purpose, one where the end goal is to leave feeling you are more energized and ready to take on the challenges of the everyday world. What is a Cleansing Retreat? There are several strategies that can be used at these retreats. At the Art of Living Center in North Carolina offers cleansing retreats designed to detoxify the body using relaxing spa services, nourishing Ayurvedic techniques, and a venue that helps each attendee become more in touch with nature. Daily Ayurvedic Meals – Delicious meals cooked by trained chefs that nourish and detoxify the body. 10-14 Spa Treatments – A variety of relaxing and enjoyable spa treatments that give you that sense of relaxation that eliminates tension and stress. Daily Progressive Yoga and Meditation – Engagement in yoga and meditation that helps to bring you more in touch with your spirituality, and develop mindfulness that can help you address upcoming challenges. Every cleansing retreat addresses detoxification and relaxation differently. But the idea is the same throughout – to eliminate toxins in your body so that you feel alert, energized, and in many ways like a new person. It is to give you that restart that so many people need to feel more vibrant, strong, and calm, able to work and play at your peak capacity and be ready to give all of your energy to any task you undertake. Are you an instructor in the health and wellness industry? If you’ve got the passion to incorporate these types of cleansing practices into your life as well as share it with others, then we can help. Mindful Balance Retreats has many amazing destinations to choose from that would be the perfect space to hold your own cleansing retreat. Unless you’ve been hiding under a rock, it’s hard to miss the incredible photos and stories of yoga teachers practicing and teaching in exotic locations. Leading a retreat is an amazing step forward in your teaching career. You’ll have a chance to engage with your client base in paradise! As a bonus, you’ll get a nice boost to your income while doing something you love. A retreat experience can reinvigorate your regular classes, and give you new inspiration and insight. Prospective retreat leaders often come to Mindful Balance Retreats with questions. We’ve rounded up seven of our most common queries for you. Students in gorgeous Chacala, Mexico. What are the requirements for retreat leaders? How much experience do I need? You do not have to have experience leading retreats in order to partner with us. There are, however, a few basic requirements we have for our retreat leaders. 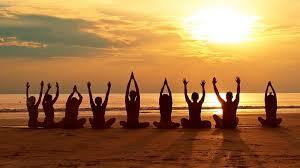 We only accept certified and insured yoga teachers. We ask that you submit proof of insurance and certification along with CPR certification. We also want to set you up for success by making sure you have the experience necessary to lead your students in a new environment. Retreat leaders must have at least two years of consistent teaching experience and teach a minimum of six classes per week. Leading workshops or involvement with yoga teacher training programs can also help you develop the skills necessary to be a great retreat leader. In addition to being an experienced instructor, we also ask that prospective leaders have a strong client base and established email list or studio partnership. You can plan the most incredible retreat in the world, but if you don’t have an target audience, you’ll have a hard time filling slots. If this isn’t you just yet, don’t worry. Think about the steps you can take to build the skills a retreat leader needs to have. Get in touch when you’re ready. We’d love to hear what you have in mind. 2. Why enlist the help of Mindful Balance Retreats? You can absolutely plan a retreat on your own, but there are some serious advantages to working with us. First and foremost, we have years of experience leading retreats. We understand best practices and common pitfalls. We can help steer your retreat in a direction that will lead to happy students. Mindful Balance Retreats has your back every step of the way so that you can stay focused on bringing your best self. We also help with marketing. We’ll set you up with a website so that you can advertise and handle transactions. You’ll be able to reach your network more effectively and reach beyond your network. We offer support to your guests from the moment they sign up. Whether it’s figuring out what to pack or where to go on an optional excursion, we’ve got information, and we’re happy to share. This takes some of the onus off you, and it helps students feel supported in their journey. 3. I like the itineraries on your website, but I’d like to do something different. Can I make some changes or pick a different location? The itineraries on our website are examples of what is possible, but your retreat is yours to shape as you wish. We would love for you to customize your retreat to meet the needs the of your students. Whether that means trying out a new location or modeling your retreat after the itinerary of an existing retreat, we’re all ears and happy to help. Experience culinary and gustatory magic happening in Panama! 4. What do I do if I have a student with many dietary restrictions? Your student can still enjoy being part of the retreat! All of the retreat centers we work with are happy to accommodate any dietary restrictions, an intake form will cover all of that upon registration. We’ll also help you plan the meals for your trip, so if there are particular dietary choices you want to make for your retreat, we can make a plan that accommodates those wishes. Let’s put our MA in Holistic Nutrition to work for you! 5. What happens if I have a student who really doesn’t want to do one of the excursions? We want you to make the most of your retreat and listen to what is best for you. All of the classes, excursions and activities are optional. If a student needs to spend a day relaxing or has a specific reason you’d prefer to not to take an excursion, that’s a-okay. This experience is all about what you and your students need. 6. How much lead time do I need to plan a retreat? To plan efficiently, it’s Ideal to start the process 9-12 months out for international retreats and 6 months out for local weekend retreats. It may sound like a lot of time, but it really flies by. This gives us ample time to collaborate, advertise, and prepare your guests for their adventure. 7. I have an organization that I’m passionate about supporting. Can they be part of your karma yoga program? We absolutely love our karma yoga partners, but we’re always eager to work with anyone serving the greater good. We would love to support your passions! Let us know which organization you’d like to help out so we can contact them and make sure they are open to this collaboration. There’s no doubt that leading a retreat can feel like a big undertaking. It’s natural to have many questions. We’re here to help! Didn’t see the answer to your question? Don’t hesitate to reach out to us here. It has become increasingly more common for people to vacation in areas of the world where they can directly contribute to the conservation of the land and help preserve the sensitive ecology that is being threatened by humanity’s destructive ways. 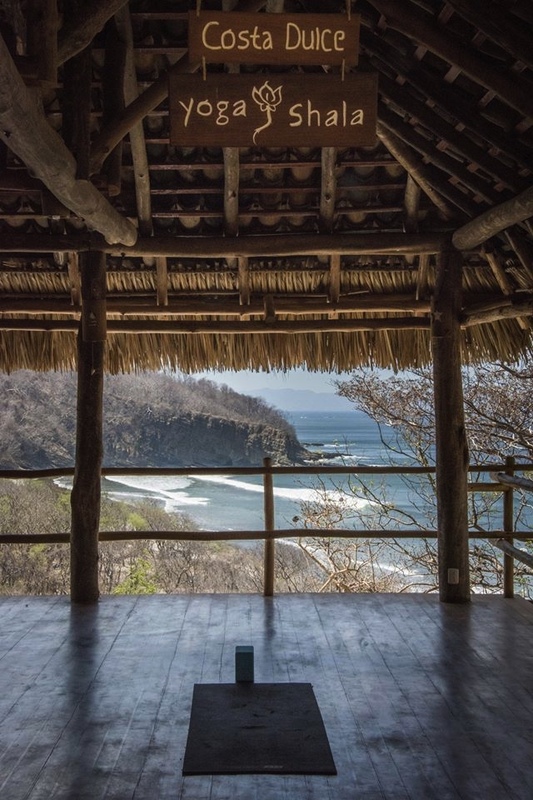 Our destination for the “Touching the Emptiness” retreat is the Costa Dulce Eco-Resort and Retreat Center, which is nestled between the jungle and a sea turtle hatchery at Playa Escameca Grande beach, near San Juan del Sur, Nicaragua. Costa Dulce’s core mission is to positively contribute to our collective social and environmental well being. By simply enjoying the beauty of the Costa Dulce Eco-Resort you will help them succeed with their many community and environmental initiatives! As a beach resort and an eco-lodge it comes naturally to focus on protecting the ocean. Costa Dulce has a successful partnership with Vital Action Project that supports the sea turtle hatchery right in front of the hotel. 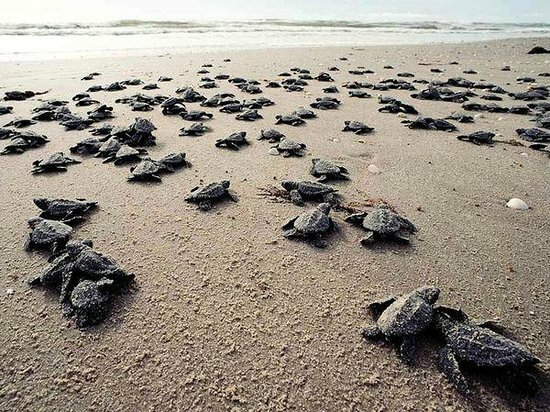 In their first year of operation, 10,000 baby turtles were successfully released into the ocean. Regular beach clean ups also take place, with the intention of keeping the beach in it’s beautiful natural state. It has always been a challenge to get a complete education in rural Nicaragua. It is no different in the Playa Escameca area. Without a local high school, the drop out rate is an astounding 95%! 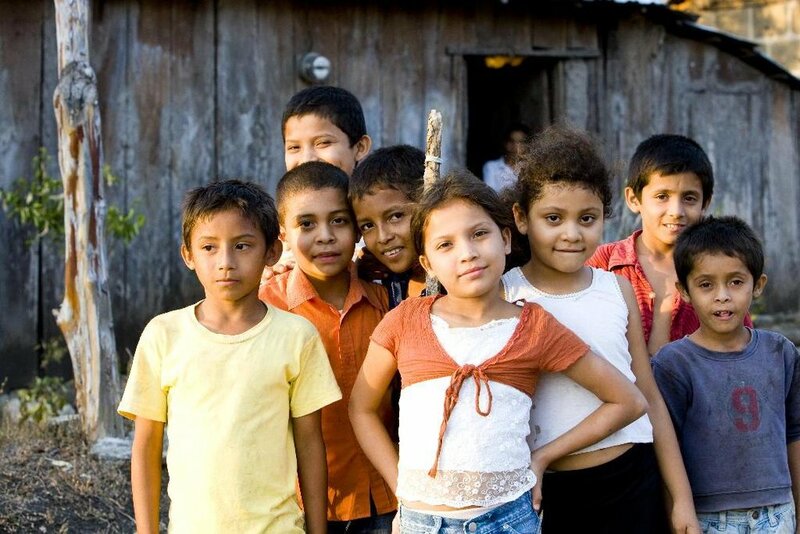 Many kids need to take a bus to San Juan del Sur to complete high school. This is beyond the economic means of many families. Costa Dulce has partnered with Barrio Planta Project on the Escamequita Project. The Escamequita Project will eventually be a school/community center for the town of Escamequita (closest town to Costa Dulce). 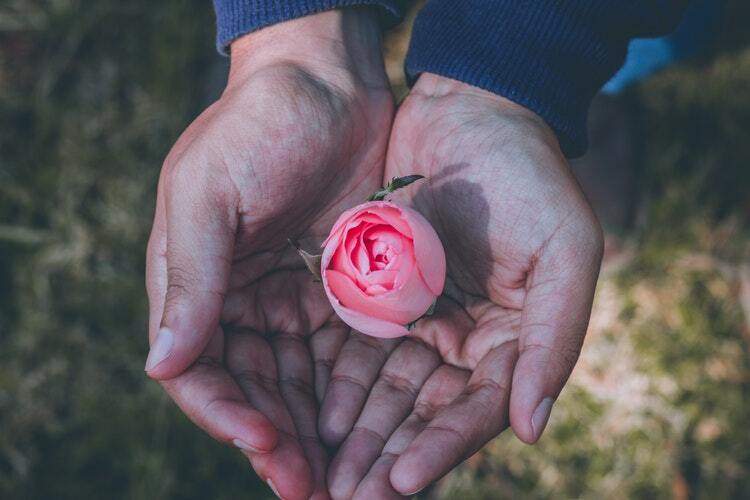 In an effort to maintain our spiritual connections with all of our planet’s inhabitants, the “Touching the Emptiness” retreat led by Jack Greene offers an opportunity to explore, conserve and play. We will enjoy a week of relaxation and connection through yoga and other movement traditions, meditation and breathwork and plenty of time to play in nature. In addition to our group practices and activities, there will be ample free time to explore the Playa Escameca area through jungle/waterfall hikes, SUP adventures in a nearby river, visiting the turtle hatchery, horseback riding, and of course surfing! Costa Dulce Eco-Resort offers the perfect blend of natural living and rustic luxury, providing much needed relaxation, tranquility and ultimately, emptiness. Join us this December 8-15, 2018 as we seek to discover who we really are underneath it all, the vast peaceful emptiness within. “Touching the Emptiness – Becoming Who We Really Are” is calling you…will you answer? $500 deposits are being accepted now to secure your space. 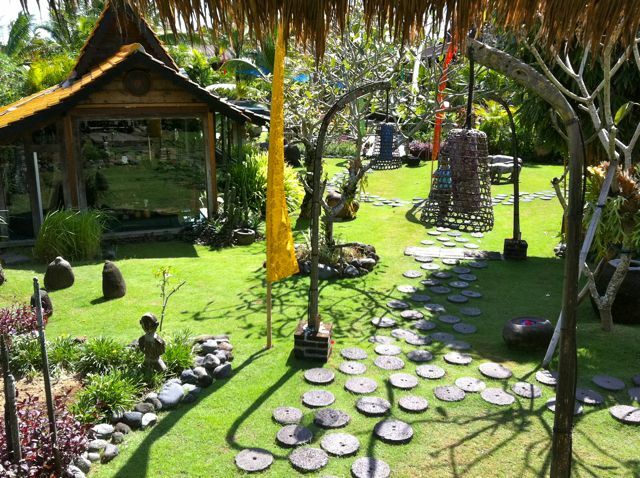 One of the many retreats we love at Mindful Balance Retreats is our retreat to Bali. Bali, an island in the Indonesian archipelago, is sometimes referred to as the Island of the Gods. The island comes by the moniker honestly. The stunning landscape and deep spirituality of its people set it apart. It's a go-to destination for people trying to satisfy their wanderlust and need for self-reflection. Our retreat in Bali focuses on healing and restoration. Every day begins with a series of mindfulness practices and opportunities for self-reflection. If you've been having trouble carving out the time to take care of yourself, this trip is an incredible opportunity to jumpstart healthy habits. Take some time to practice asana, meditate, or journal before you set out on the day's adventures. Every afternoon, we have a restorative yoga practice with aromatherapy and healing touch. Our Bali retreat also includes a massage to give you the maximum healing benefit of all these practices. Feel your stress melt away as you tend to your body and mind. The lush volcanic landscape provides plenty of healthy foods to nurture your physical body. We start off every day on the right foot with a nourishing organic breakfast. An on-site restaurant offers organic fare, and you'll have the chance to do a 1-day juice cleanse if you wish. Bali is known for its natural beauty and affordability compared to other island destinations. During our retreat, we stay at the stunning Desa Seni eco-village, where you'll have access to on-site-yoga (of course! ), a saltwater pool, a sun deck, and a spa. The antique wooden houses of Desa Seni are arranged in the style of a traditional Indonesian village. 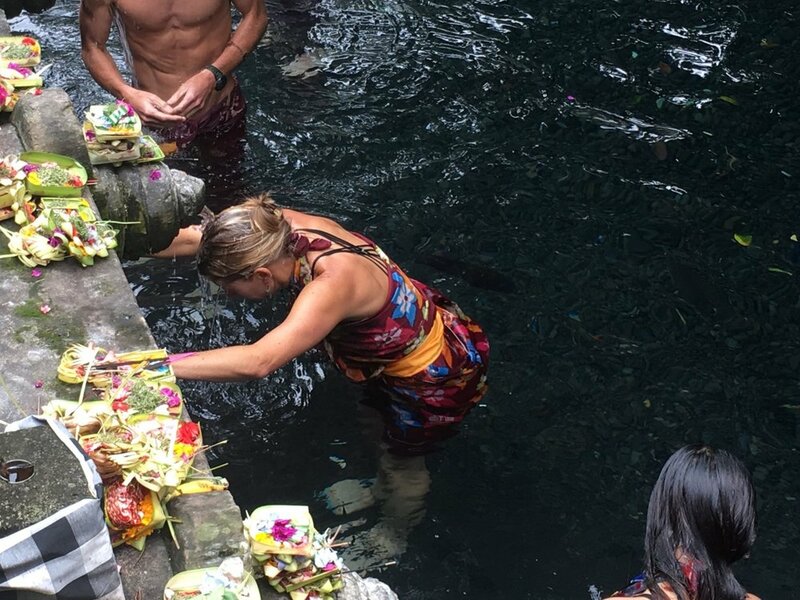 We are staying in an incredible place, but you'll also have the chance to visit sacred Balinese temples and well as wander around the streets of Ubud, where food, shopping and monkeys are abundant. Most of us struggle to find the time for introspection every day. There's so much noise competing for our attention. For this reason, we devote one day of our retreat to silence. In Bali, you can create the space that you need to work toward your wellness goals. Dedicated time to practice the niyama, svadhyaya (self-reflection), is an opportunity you're rarely afforded in class, but on this retreat, it's a major focus. Taking time away from your regular routine can put you on a path to healing. You'll not only feel better, but there's a good chance that you'll be more productive after doing some inner work on the Island of the Gods. When you return from Bali, you'll carry the fruits of deep and introspective practice into your life. Can you see yourself retreating to Bali this year....Join us.... or Lead it?